In this article, you will find information and examples on the following topics associated with working with JSON and XML data sources. JSON and XML are hierarchical data formats. 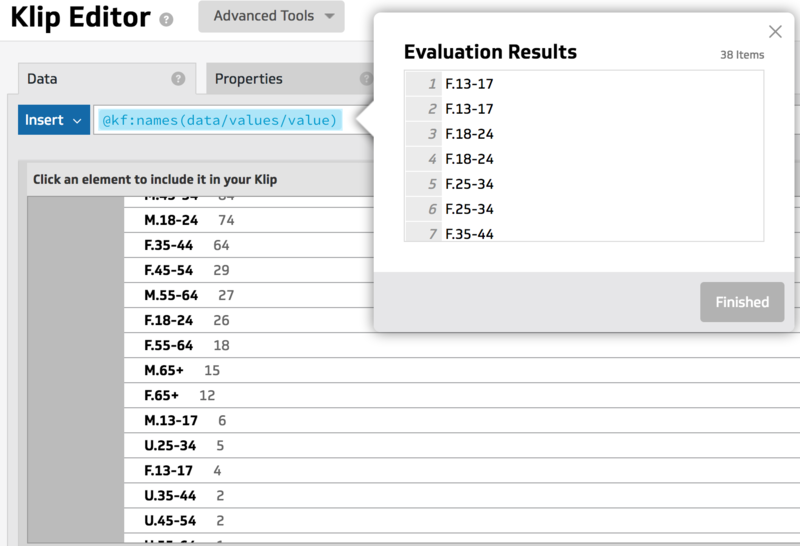 objects: one or more field name and value pairs, indicated in Klipfolio by curly braces. arrays: lists of elements of the same type, indicated in Klipfolio by square brackets. The first image below shows how to choose a data source in the formula editor. The second image shows how the XPath is displayed in the formula once the data source is chosen. The @ and ; outlined in purple are the data source reference and enclose the editable XPath, which is outlined in red. Note: The ; is only displayed when the XPath is being edited. Some data sources use '@' as the first character in their field name (shown in this example) or as an attribute. It is important not to get them confused with the data source reference. When you select data from a JSON or XML data source, the selected field’s path, or XPath, is displayed in the formula editor. You can type the path or you can click on the Selection Options link. In the following image, the XPath of the first_name element is /player/first_name. Select only this <field name> element. 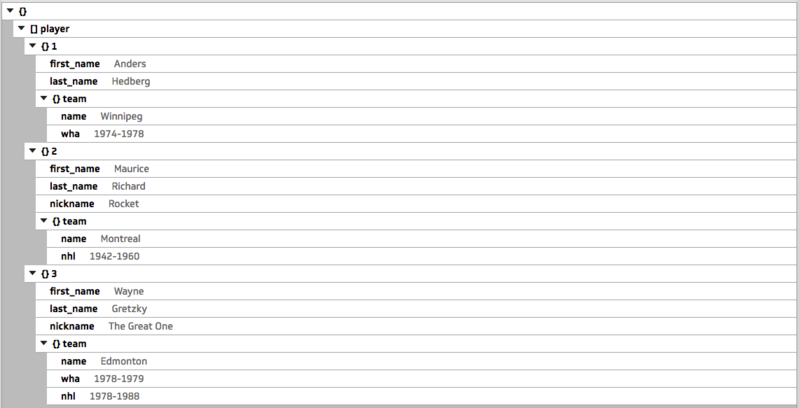 Only one specific <field_name> element is selected (equivalent to selecting a specific cell in Excel). The formula editor displays the specific path: @/player/first_name. Select all peer <field name> elements. 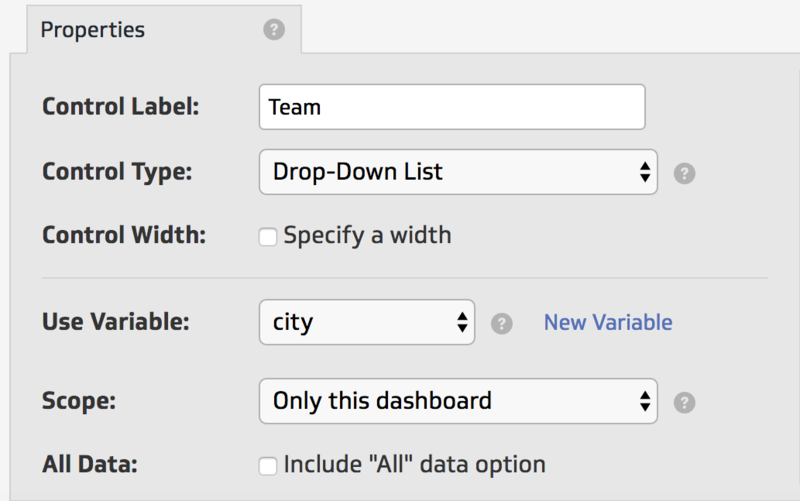 All <field_name> elements at this level of the hierarchy are selected (equivalent to selecting a column of data in a table). The formula editor displays the path: @/player/first_name. Select all <field_name> elements. All <field_name> elements at any level of the hierarchy are selected: @//first_name. Select all <field_name> elements in this parent element. All <field_name> elements in this branch of the hierarchy are selected:@/player/first_name. An XPath expression is used to select elements based on specified criteria. Select the last_name of a player: @/player/last_name This will return all player/last_name elements. Type the expression, [team/name='Winnipeg'], after /player to select only the last names of players on team Winnipeg. This says: for all player elements with descendant team/name equal to Winnipeg, select the last_name element. This example uses the contains function and the name function to select all elements based on a field name. This says: for all /player elements, select any values where the field name contains: "name"
This expression returns Anders, Hedberg, Maurice, Richard, Rocket, Wayne, Gretzky, The Great One. @/player/* selects all immediate descendant values in the player element. @/player/* selects all immediate descendant values (denoted by /*) in the second player element. JSON elements with field names that begin with non-alphabetic characters (as shown in the following data source) cannot be selected directly. Instead it is necessary to manually type the path in the formula editor. Note: The purple @ refers to the data source of the XPath. See selecting a JSON or XML data source. These examples use the name function. first_name, last_name, nickname, teams/name, teams/wha and teams/nhl are descendants of player. first_name, last_name and nickname are children of player. first_name is a preceding-sibling of last_name. last_name is a following-sibling of first_name. Sometimes more complex XPath manipulation is required to access and align JSON data. Select an element at the position specified by index. This function is used when a field name is unnamed and is instead referenced by number (position). As is, the data incorrectly aligns Anders with the nickname, Rocket, and Maurice with the nickname, The Great One. Note: This function does not work for nested arrays. The kf:names function returns the names of all fields contained in an element. This is useful when the field names identify categories such as demographics or countries. The following show more examples using the data source featured in the previous function (kf:fill_elements). Unnamed fields cannot be selected directly; see kf:element_at. Field names that begin with a non-alphabetic character cannot be selected directly; see the Example 4 in XPath Expressions. Klipfolio functions like DATASOURCE and CONCAT can be used together for more flexible XPath editing. 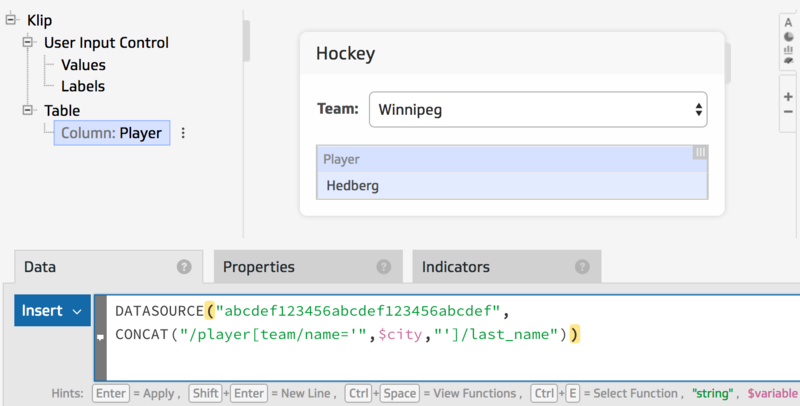 In the XPath Expressions section, the first example selected elements by matching a specific value, where /player[team/name='Winnipeg']/last_name selected the last_name for all /player elements with descendant team/name equal to Winnipeg. Use CONCAT to manipulate the XPath so you can add a variable. In the XPath, /player[team/name='Winnipeg']/last_name, replace "Winnipeg", with the variable (city). If city= Montreal, this formula returns /player[team/name='Montreal']/last_name. Then use DATASOURCE to specify which data source (using the data source ID) to apply this reference to.